At any given moment, we are faced with boundless opportunities. These choices are there for us in every aspect of our life. The more we are aware of the possibilities and take responsibility for our choices, the richer and more fulfilling our lives become. To help you recognize the opportunities that pass each day, Karen Sherman shares her wisdom on some key lifestyle topics. She clearly is the Coach of Choice as she guides you through important insights delivered in a lively, understandable, and humorous presentation. Above all else — Karen Sherman’s real! Are you looking for a boost in creativity, focus, and communication skills at your office? Would your group be best served by a workshop? Are the participants geographically scattered and need to be brought together through a teleconference? When you can make effective and powerful choices there is no limit to the added impact you can have at work and at home. Participants in Dr. Sherman’s programs often experience better health and take fewer sick-days each year. They find they are more willing to use rather than lose time, no longer procrastinating the tasks before them, and they find a new and creative interest in their work. Whether you are trying to follow your dreams or just improve your bottom line, the Art of Choice is a powerful tool at your disposal. Karen Sherman is now available for speaking engagements, either to lead one of her current Art of Choice seminars or to customize a workshop that suits your personal or professional needs. She will work with you to create the program that fits the needs and requirements of your group. 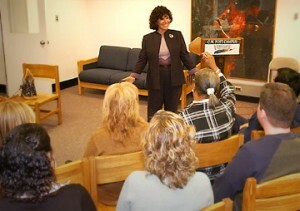 To all of these events, Dr. Sherman brings her warmth, her humor and most of all her authenticity. Book Dr. Karen to speak to your group. Each of us is entitled to a life we want, yet most of us are unhappy because we’re so caught up in reacting. We continue to recycle old patterns, which keep us stuck and emotionally frozen. But by learning the tools in the Art of Choice, we can become aware of how to live mindfully, and to separate our current options from our past choices, thereby creating the life we want today. Stress is a normal part of life. Actually, some stress is healthy. But stress can easily reach levels that are too high and can work against your health. Learn what stress is, how it impacts your well-being, and how to control it. A basic understanding plus some simple skills could save your life. This is a seminar of choice, both for individuals who regularly feel plagued by worry and doubt, and for companies that wish to foster more enjoyable and productive offices. Though we all know that men and women are different, it’s hard to accept and work with those differences when you’re in a relationship. This seminar illuminates what those differences are in style, thinking, and communication. By understanding and respecting these differences, you can achieve a greater harmony in your relationship. It’s not as baffling as you might think. The old saying is that money doesn’t buy happiness. Now research has actually shown that happiness does come largely from a positive mindset. By examining where we come from in our every day lives, we can teach people to reframe their mindset in order to enjoy a happier, longer, and more satisfying life. You, too, can choose to do so. College is one of the most powerful experiences in many people’s lives, a cascading waterfall of new experiences, endeavors, habits, and patterns that will follow them throughout their lives. Karen Sherman delivers a powerful seminar that helps college students set goals, plan for their futures, and create patterns and trends that will serve them for life, even as they enjoy the eye-opening academic and social experiences that they will always remember.